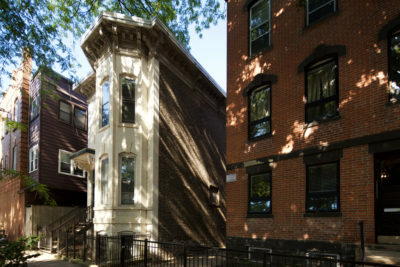 One of the most distinctive features of Jensen’s masterpiece design in Columbus Park is the collection of waterfalls that flow over pools of stratified stone. During the colder months there is no flowing water, but the scene is still serene when the pools become moments frozen in time and place. 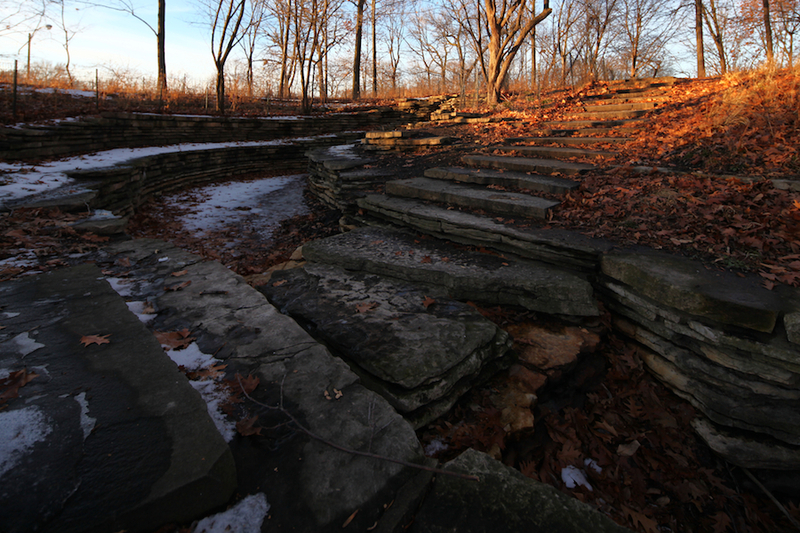 Named the ”dean of the world’s landscape architects” in his 1951 New York Times obituary, and considered the landscape counterpart of his Prairie School collaborator Frank Lloyd Wright, Jensen is little known today. 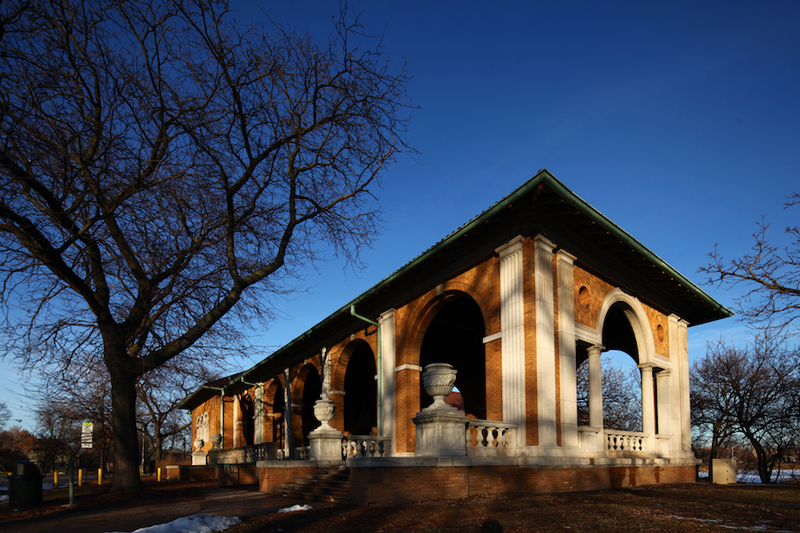 Only a few of the hundreds of estates and parks he designed remain intact. 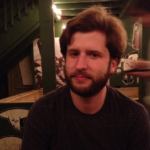 Spend enough time in the rolling and carefully thought out landscapes he has designed, and it’s easy to see why he is considered among the greatest. Jensen was a sculptor of the earth, but he was also a sculptor of light. The waterfalls in Columbus Park are situated mirroring each other on a hill–so whether it is morning or night, one of them catches the warm light of the setting or rising sun. 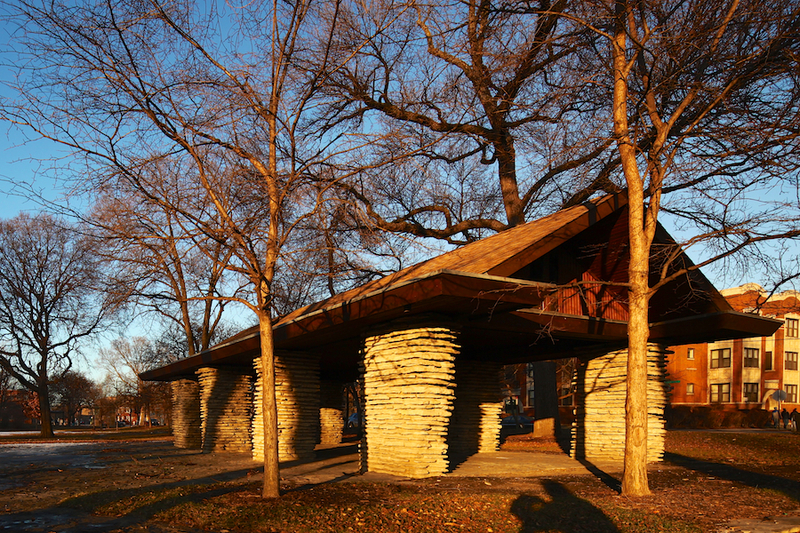 The children’s shelter is one of the most conspicuous indicators of the park’s Prairie Style design. 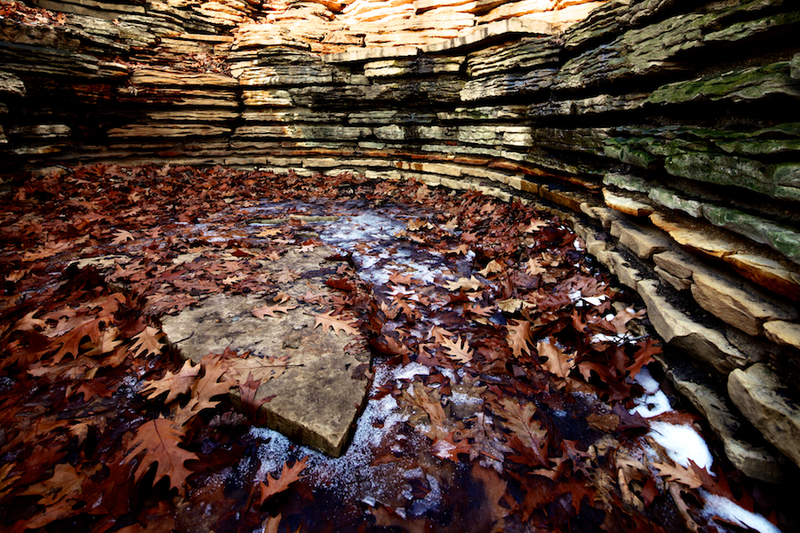 Similar to the waterfalls and stone paths, the supporting piers are made of stratified limestone. Just past the children’s shelter is the Council Ring, one of his favorite design elements. 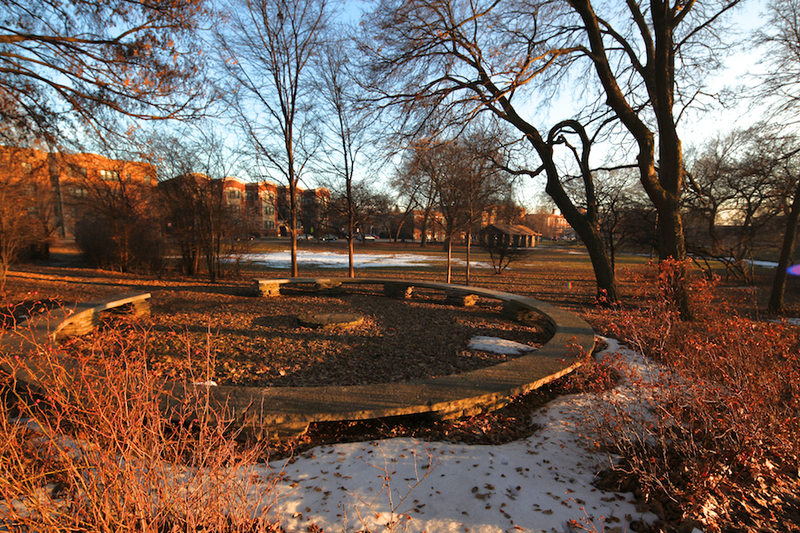 Originally envisioned as an extension of the children’s play area, the Council Ring was intended to be the foundation for small gatherings, and in particular storytelling. A ring speaks of strength and friendship and is one of the great symbols of mankind. The fire in the center portrays the beginning of civilization, and it was around the fire our forefathers gathered when they first placed foot on this continent. 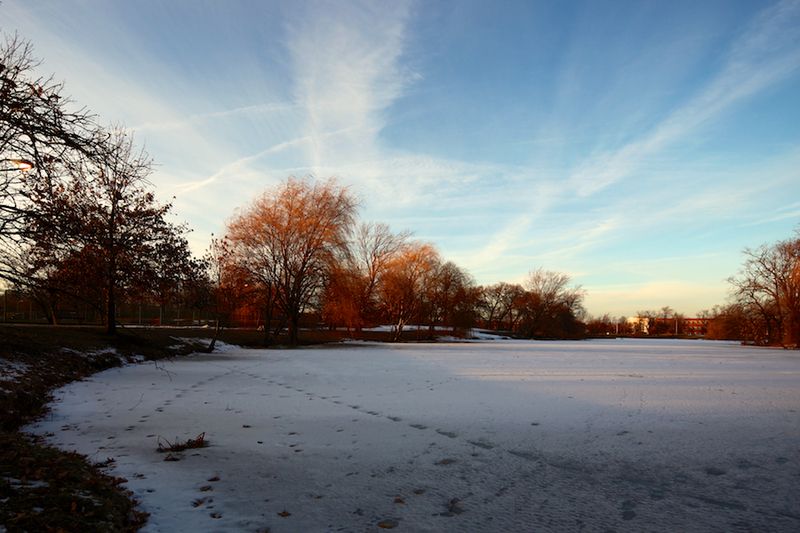 When the lagoon is frozen during the winter months, it’s fun to look at the various sets of animal tracks of creatures taking a shortcut across the solid surface. It’s even more interesting when considering that the lagoon was envisioned as a “prairie river,” inspired by the site’s ancient beach. To build the $183 million expressway, hundreds of buildings had to be razed, 3,000 graves in two cemeteries had to be relocated, and a tunnel had to be knocked through the base of the main post office near Canal Street. The path of this new expressway (named the Eisenhower in 1964) went through the park, but fortunately only a small amount of land was lost. One consequence of this was moving the 1917 stable to its current location. 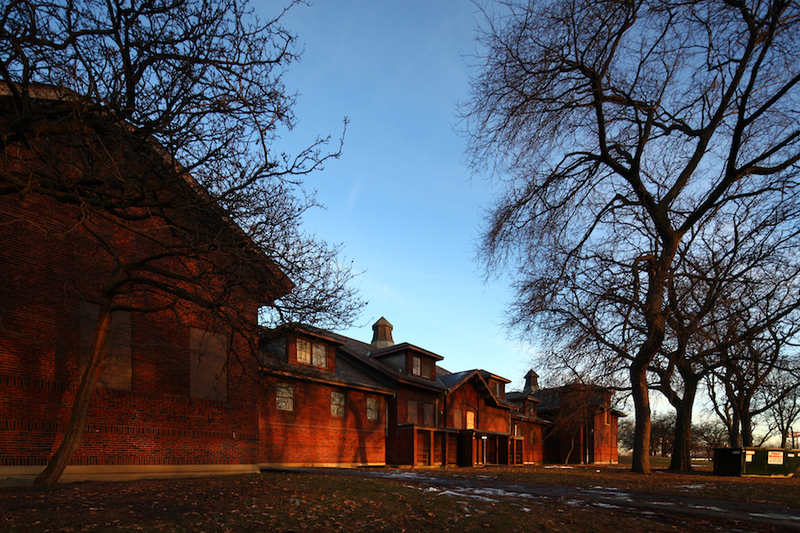 The Stables and Field House were built during Jensen’s time of designing the park, although the building styles were not part of his vision. The Stables building is now a gymnasium. 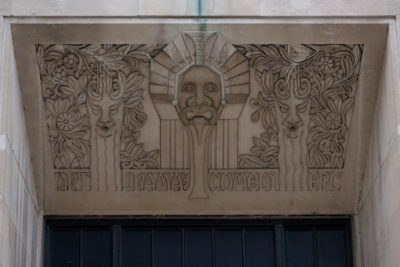 Planning and design began in 1915, and continued for 5 years. This was his first and only chance to build a large park for residents of the city. His involvement ended in 1920 when all West Park commissioners were removed from their posts, and Jensen lost his political support. 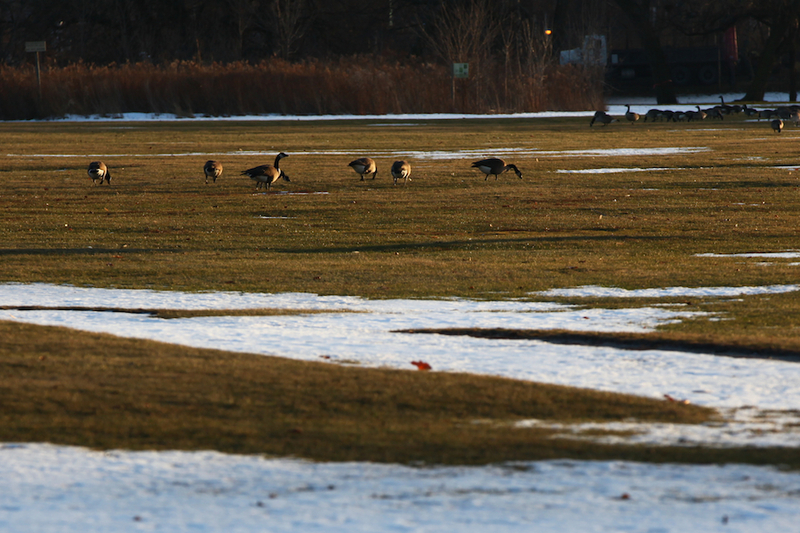 Soon afterward he parted ways with the park system. By the time of his departure the park was largely completed, minus a final piece of the plan: the boat house and refectory overlooking the lagoon. 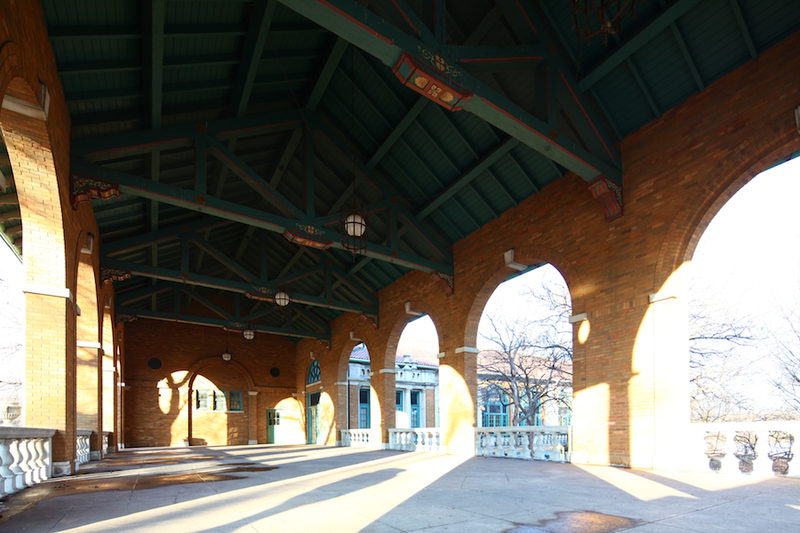 Although Jensen’s plans unsurprisingly called for the final pieces to be in the Prairie Style, the new commissioners took a different path and chose a Mediterranean revival influence for the boat house and refectory. On the eastern side of the park lie two Prairie Style lamps. 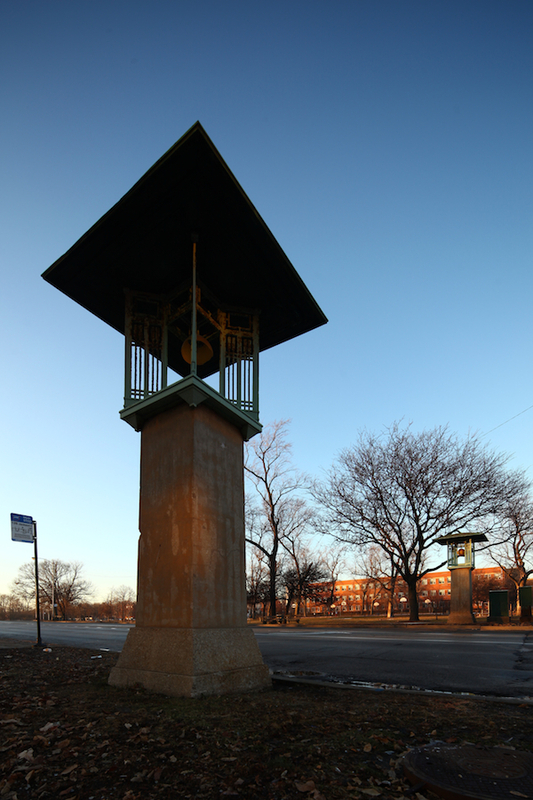 Although not part of the original plan, they are in the same spirit and identical in appearance to lamps he designed for Humboldt Park. On the western edge of the park on Austin Boulevard is one of the few remaining comfort stations still standing along the city boulevards system. This was a WPA project building constructed in 1936, and resembles an English country house. 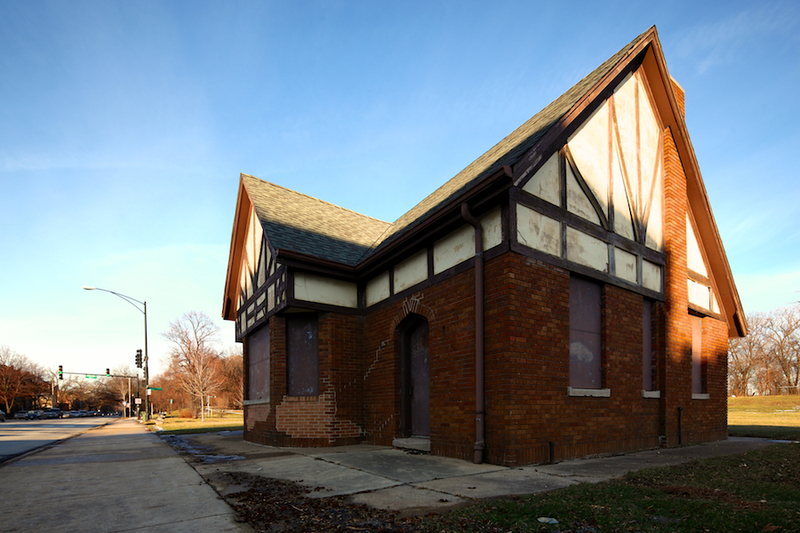 It is similar in style and appearance to the 1915 comfort station in Logan Square where Logan and Kedzie Boulevards meet. 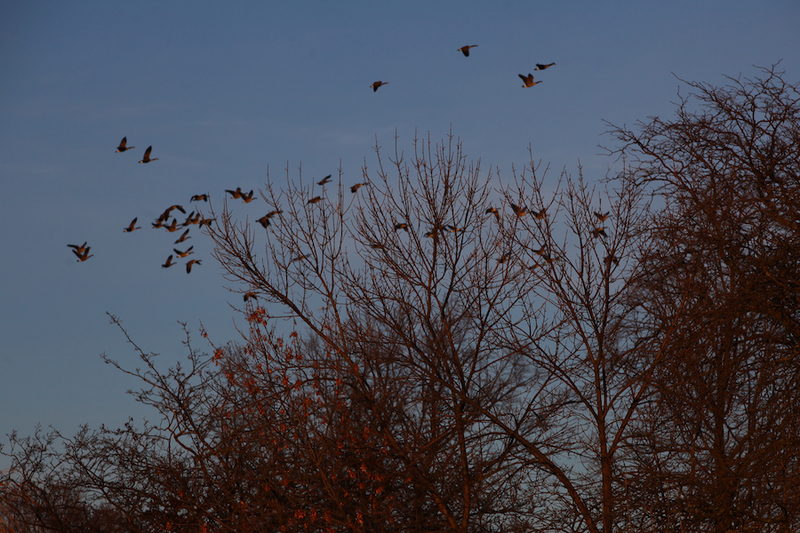 Columbus Park also has a 9-hole golf course, though during the winter birds are the only ones enjoying leisure time on the green. 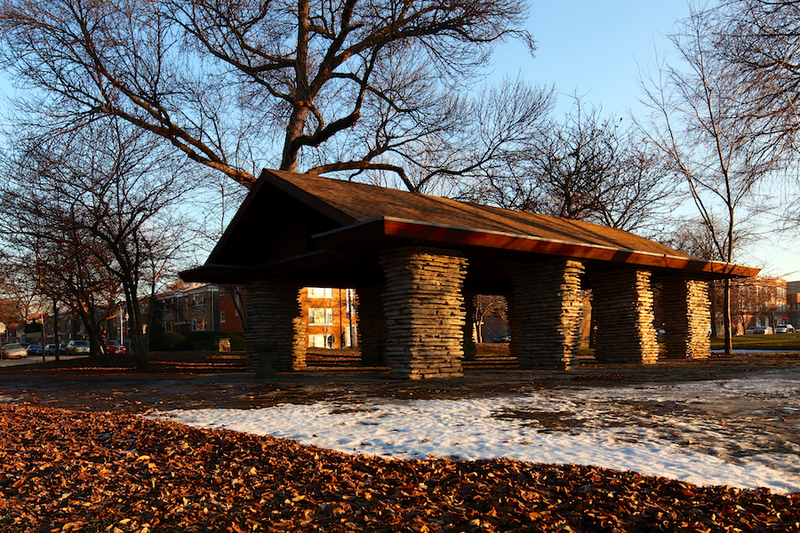 The park is a wonderful landscape architectural treasure and it’s easily accessible via the Blue Line. Be smart while exploring and visit during daylight hours. 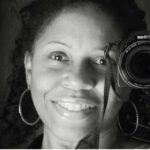 There’s a new documentary produced for PBS titled The Living Green. You can find ordering details at the official web site. This was great! I lived across the street from Columbus Park many years ago. We would walk the path along Austin to Jackson. Especially on hot summer nights. Somehow it was cooling and peaceful. I had no idea about Jen Jensen’s hand in this. Also it was well known about certain elements that plague the park. The police used to ride horse back and patrol the park. Not sure if they do that anymore.